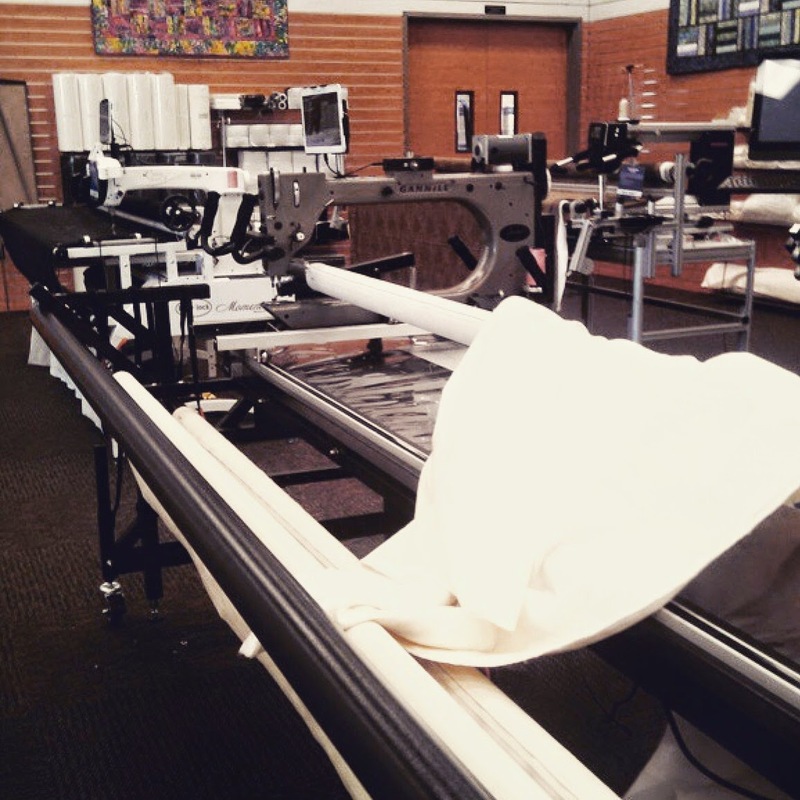 Last Tuesday I took a lesson in operating a long arm quilting machine. This is something I had been previously intimidated by. They are huge pieces of equipment that cost more than my car. I didn't quite understand how all the roller bars would work. I didn't know what pantographs or leaders were. All I know is I love the look of all over patterns and am always intimidated by custom ruler work. ( I'm still intimidated by custom ruler work.) But when my local quilt shop started offering a certification course so you could rent a long arm and finish your own quilts, I had to take the class. Until now I have always machine quilted. Yes, you can do all your quilting on a domestic sewing machine. My machine has a modest 7" throat and the largest I have done is 85x90. It takes some time and patience but it can be done. If you are a budget quilter like I am and cannot afford to send out your quilts for long arming all the time this is a great option. My LQS program is $15 per hour and I thought that if I wanted to do a particularly large quilt this would be ultimately cheaper than the time it would take me to machine quilt it and the massage appointment the next day from wrestling the quilt. How long could it take? Even 6 or 7 hours would be about $100 if it even took me that long. 1. It's going to take you an hour to load your quilt into the machine. It took me an hour my first time and they said that was quick for newbies. You have to be very delicate with your top and bottom so you don't get wrinkles and everything rolls smoothly. The pinning takes the majority of the time but is important so that everything lays flat and secure. If your quilt shop allows you to supply your own leaders you can pin at home and just zip your zipper into the machine. If not, budget for an hour of loading. 2. Pantographs are your friend. Pantographs are these beautiful designs you can print out of the computer or order online that you trace via laser and the machine will stitch that pattern into your quilt sandwich. www.urbanthreadz.com has a great selection. I am a skilled free motion quilter on my home machine but I wouldn't t trust myself to fmq a large quilt on a long arm just yet, and there is no shame in admitting that. machine with and I were following the same pattern but the results were very different. Not bad, just different. Like handwriting. And the only way you improve your penmanship is through a focused practice so the same will apply to the quilting. 4. Loosen up. Your going to want to be precise and focused on chasing that laser dot around but you will have much smoother results if you just relax and start swirling those horns around. (Same with cake decorating). I signed up for my first hourly session so I could practice on the quilt I made my grandma for Mothers Day. This is a quilt that is going on a couch, not in a quilt show and I expected newbie results. It actually turned out better then I imagined it would! I did a basic pantograph pattern for my first real time. 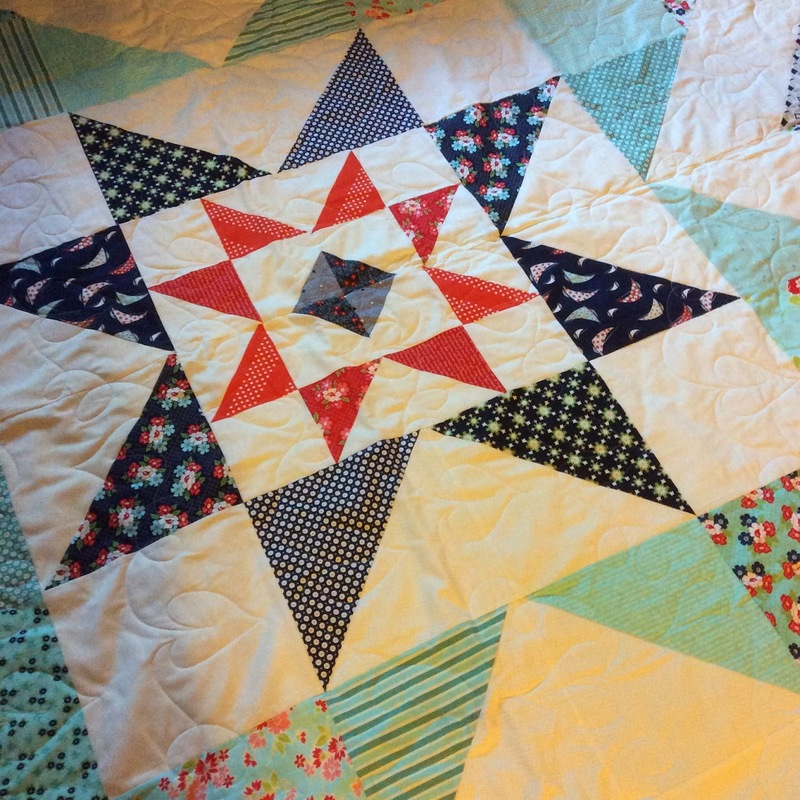 This pattern called the Triple Barn Star from Stitchery Dickory Dock. The fabric is a mix of Day Sail and Miss Kate by Bonnie and Camille for Moda. I very pleased with the results. I'm also happy to report that because of this whole experience I was hired by this shop! They saw a little spark in me and in two weeks I will be working in the new long arming department! I'm really glad I wasn't afraid of the equipment because I would have missed out on this opportunity. I want to end this by encouraging you to look into long arming services in your area. It real is fun to swirl those handles around and I'm so glad I was brave enough to try. Keep your expectations reasonable and allow yourself to be a flawed human. You are not a robot in Korea. That's actually one of my quilting mottos! It's been a pleasure being your host here this week. Make sure you look at the Instagram feed where I did a mini tutorial on how I machine bind as well as posted progress picture of the quilt I made in the a Weeks Ringle workshop. Have a happy Sunday! Angelina what quilt store did you end up going to to learn?